I was feeling so dreamy and content last night before tucking myself into bed last night that I was sure I would sleep like a log. These terrible restless legs of mine, which were behaving up until a week or so ago, have made it clear that they aim to misbehave for the rest of the pregnancy. Given that my experience with restless legs was absolutely maddening during Abby's pregnancy, and practically nonexistent during Michael's, I'm beginning to wonder if I don't have a little girl in there, after all. When I wasn't fighting against an overpowering urge to twitch my toes all night, and pushing through the over-warm, tingly, just-about-to-cramp up sensation that radiated up and down my calves, I was feeling sick to my stomach, so it was just a bad night, overall. Long story short, I didn't have the stamina today to go through every picture that was taken on Sunday, but I did manage about half. 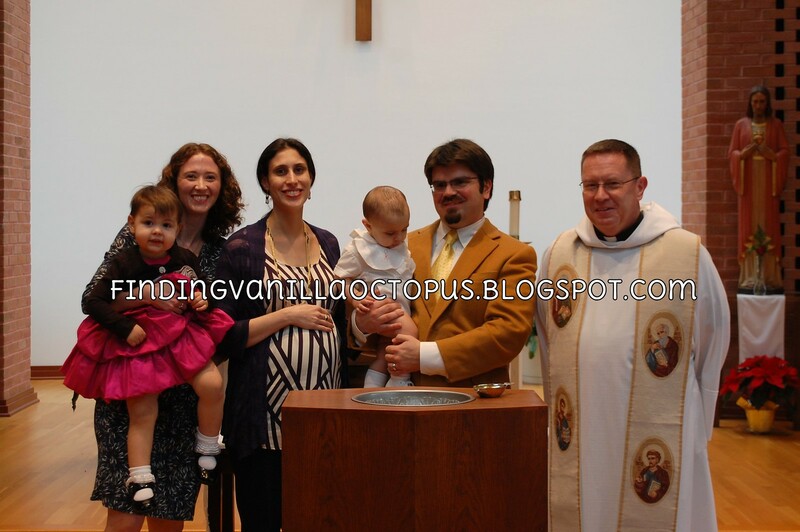 So, I present the first part of the story: the baptism itself. It was a mad rush right up to the very moment we left the house that morning, but somehow, Tom and I (with the last-minute help of our two combined extended families) pulled it together and got everyone out the door. Despite the chaos, I spared a few minutes that I really didn't have to snap a few pictures of the VIP in his fancy duds before we put him in his carseat. 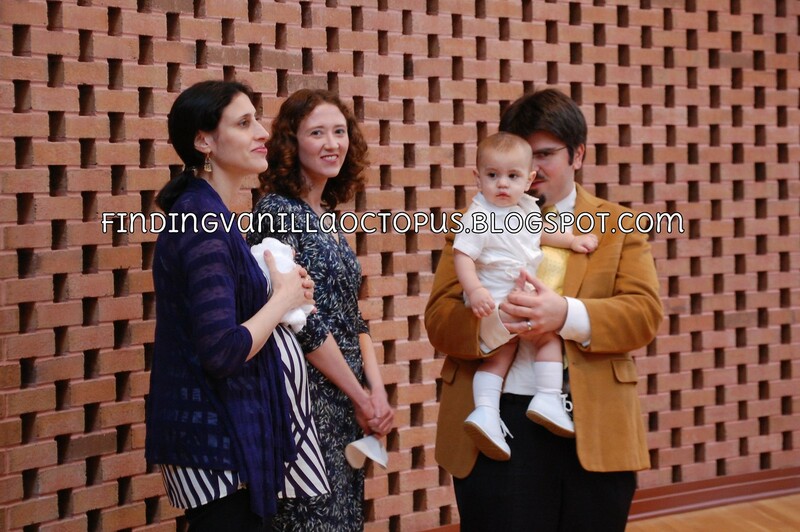 By some miracle, he was able to wear the same outfit that his father did, many years ago, even though Tom was baptized at three months old, and Michael is close to 12. Though the label on the suit says 24 months, it was actually a pretty tight fit for my little guy, who normally wears size 12 months. We were, of course, unable to use the same shoes (Tom's were, indeed, quite tiny), and Michael made it very clear that he would not tolerate the adorable bonnet. I draped it over Michael's head anyway as he sat on the floor just before our departure, and his hesitation in ripping it off was actually what inspired me to grab the camera even though I still had to get myself dressed. Sadly, I was about five seconds too late to catch him with it on, but you can see it sliding down his back in the first picture. I'd also noticed that he had grabbed a hold of one of his father's shoes, and was playing with it. That was a moment I could not bear to let pass by. This one is my favorite. He looks as though he's comparing the size of his father's shoe to his own. In the end, despite our disorganized departure, my last-minute picture-taking delays, and some irritating traffic, we arrived at church with about two minutes to spare. 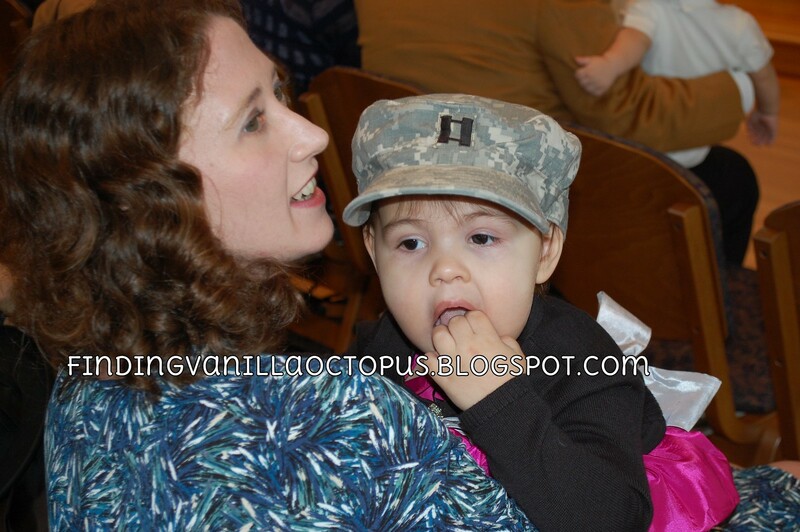 We met Mei Mei in the chapel, in her Army gear, as she'd had to come straight from her National Guard drill to attend. Mei Mei grabbed the camera to take pictures, and let Abby try on her hat. It was the perfect accent to her beautiful magenta dress, frilly white socks, and black patent shoes. Michael was raring to go as soon as we released him from his carrier. 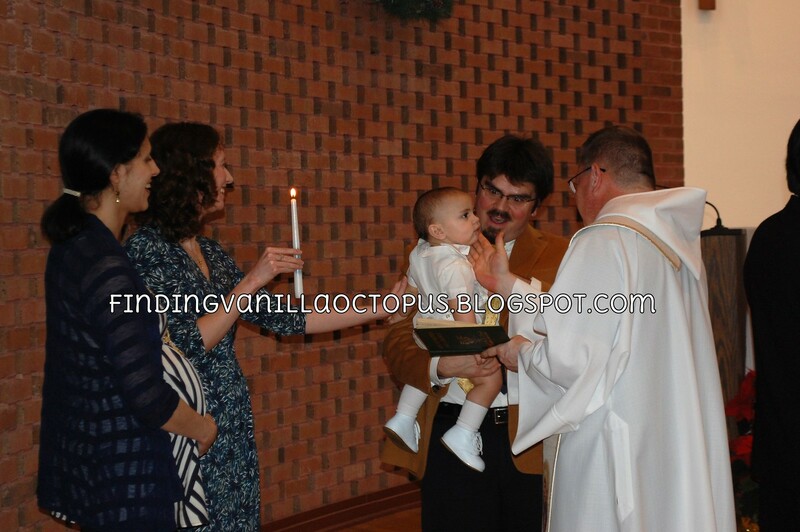 When the time came, he did not appear particularly thrilled to be having his head lowered over the baptismal fount. 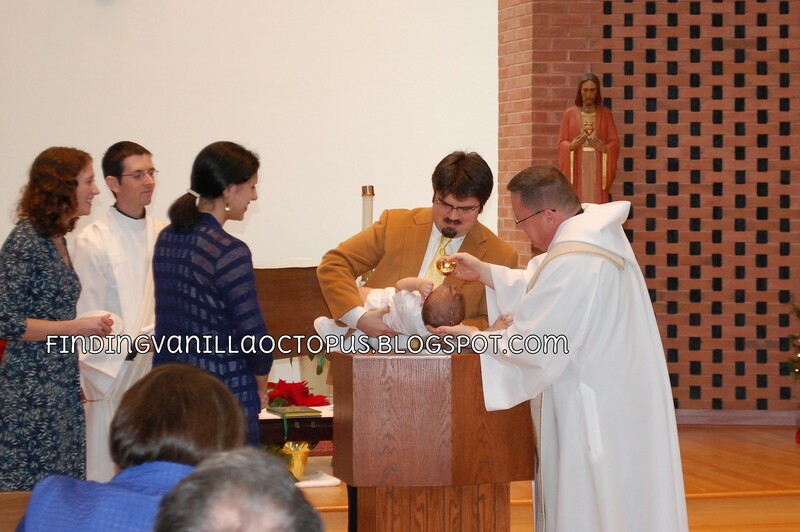 He flinched as the holy water was poured over his head, but did not cry. 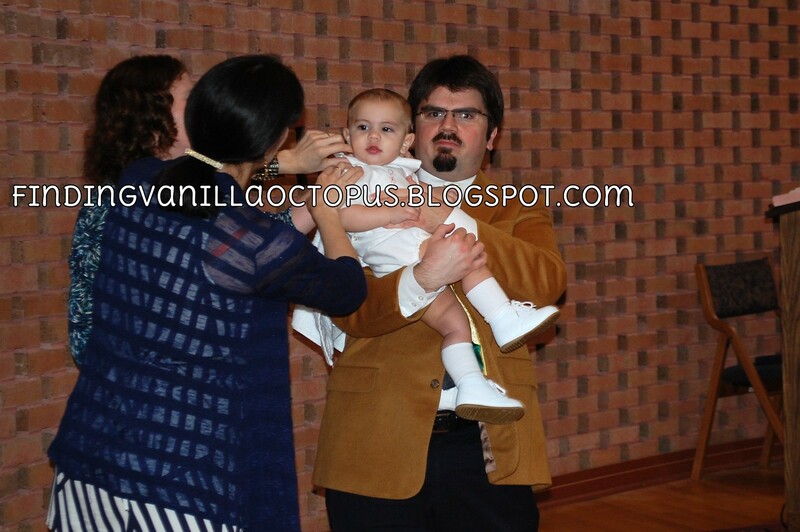 He was cool as a cucumber as we waited in line for the next part of the rite. There were two other babies present, so each family took turns for every step of the process. 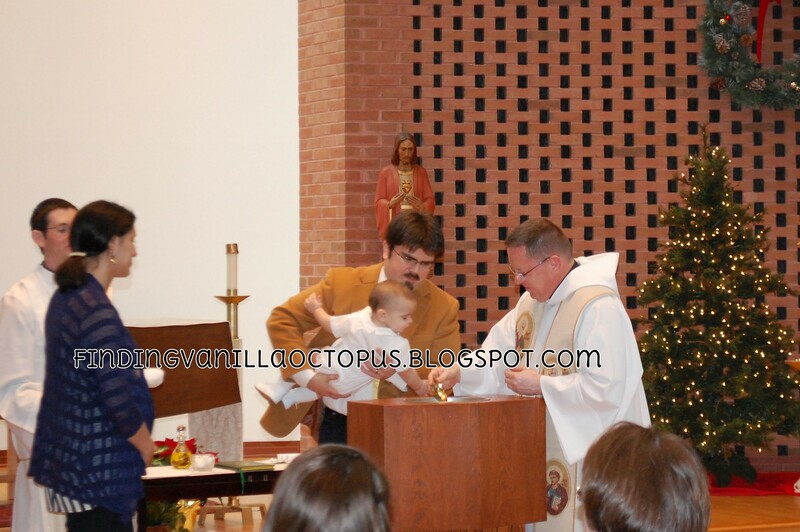 I think that the Anointing with Chrism was Michael's favorite part- he tried to grab the oil from the priest's hands, and even got a little bit on his fingers. 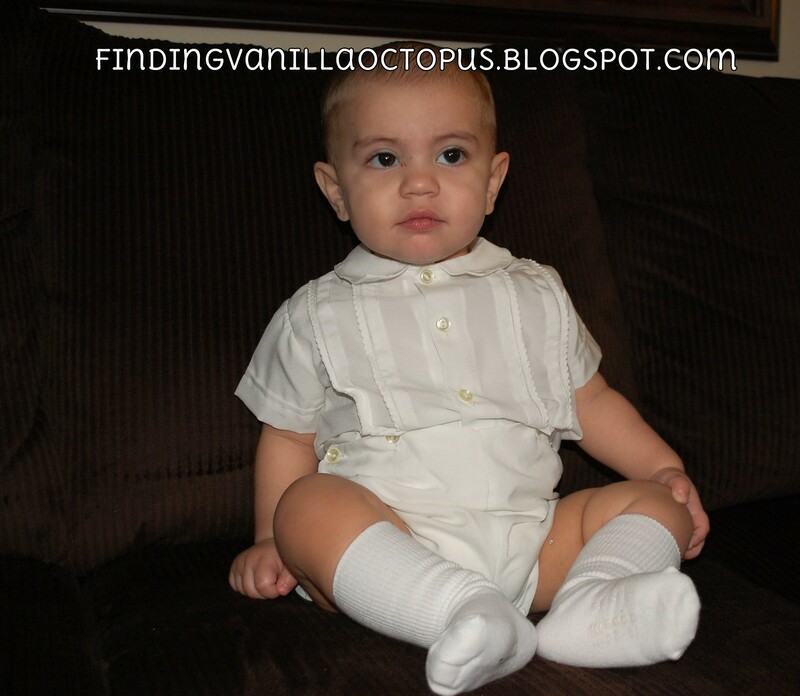 Next came the Clothing With the White Garment: in Michael's case (being a baby), a bib. This was the job of his Godmother, Lisa, but I joined in to help, because there was nothing to attach the bib to, and Michael was quite wiggly. 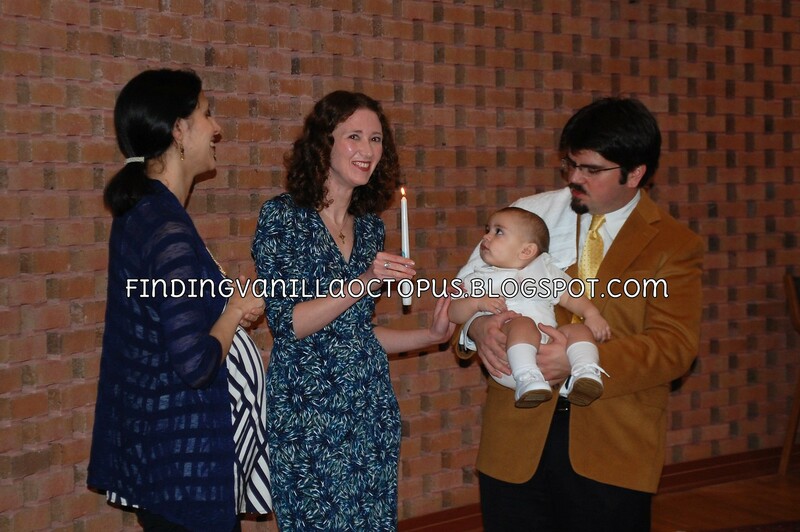 Then came the Lighted Candle, the flame taken from the Easter Candle. Lisa held it for him, but Michael was quite interested in it, so she had to keep her distance while it was lit. And lastly, the Prayer Over Ears and Mouth. 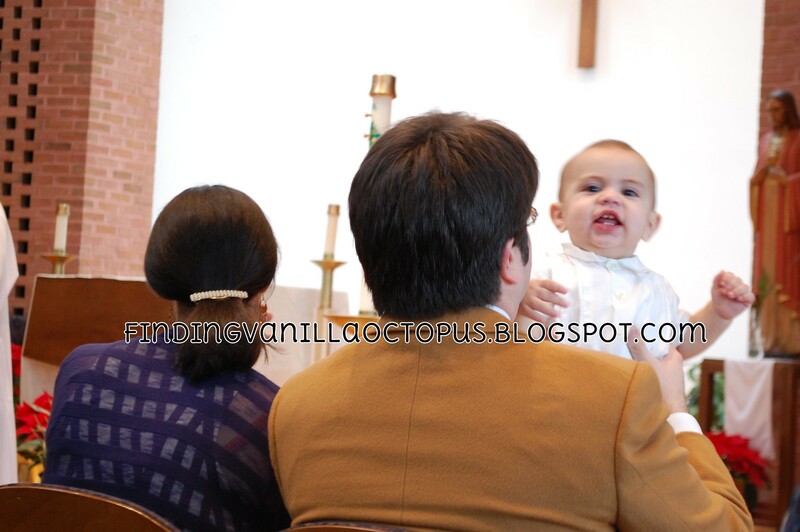 The priest was quite impressed with Michael, calling him a "bruiser." I was a little surprised to hear him described that way. He's a bit bigger than average but compared to Abby, he's always seemed so small to me. He did look rather impressive in that outfit, though- something about the tightness of the fit and the old-fashioned style, particularly those knee-socks and high-strapping shoes. 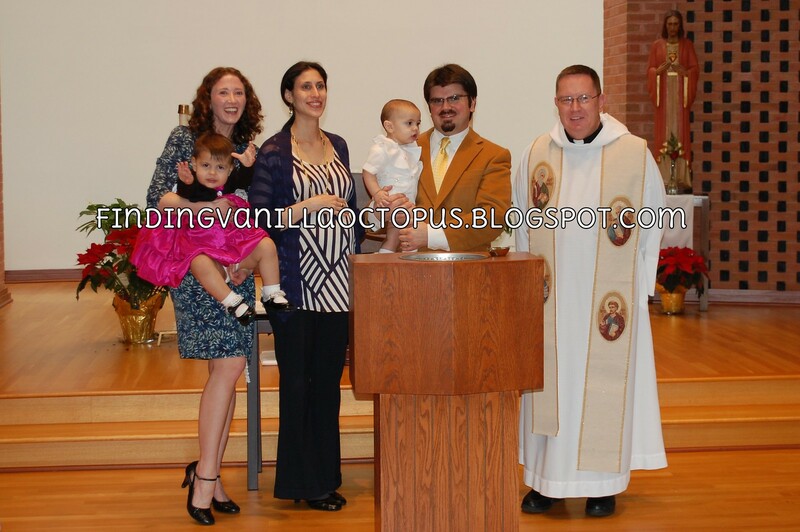 Afterwards, as we posed for a picture with the priest, Abby kept repeating, "They put oil on his head!" to the delight of all in attendance. By the third picture, however, she had grown tired of modeling, and exclaimed, "Want Ali!" with arms outstretched. Michael remained uninterested in the camera throughout. 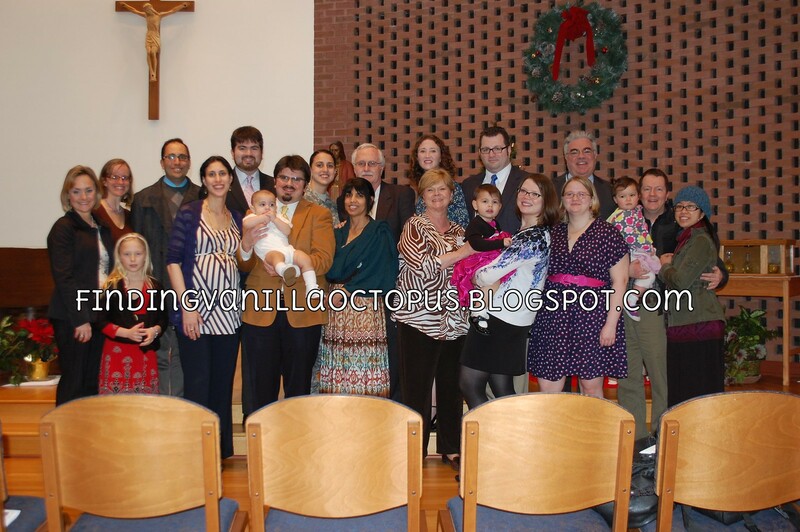 We did at least get him to (sort of) look in the right direction for this last shot, in which we included all friends and family who were able to make it to the baptism (minus Abby's godfather and his son, who volunteered to take the picture for us). On the drive back home, Tom and I discussed our plans regarding fitting in nap times for the kids during the excitement of the party. 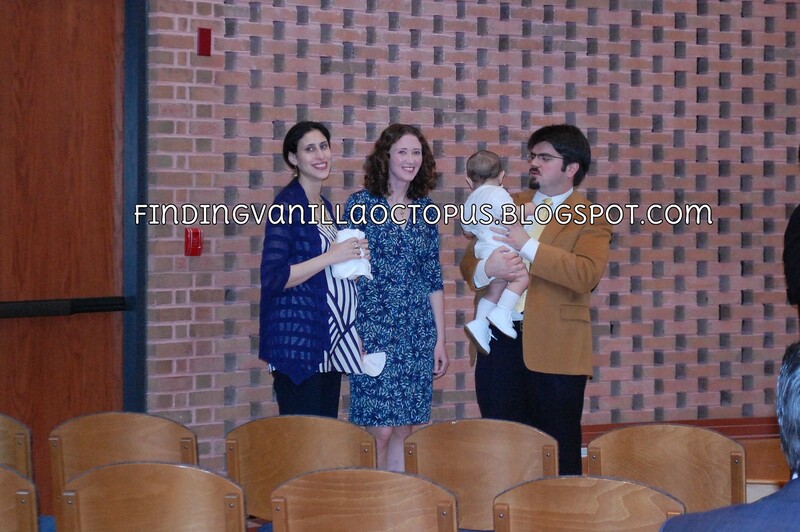 We expressed our hope that Abby would doze off in the car, so that Tom could take her directly up to the crib for as long as she would stay before introducing her to the action. I have since learned that we cannot discuss such things in her presence. Just minutes after coming to the conclusion that we would just have to "go with the flow," Tom and I heard Abby pipe up from the back, "Abby's awake!" Michael, for his part, gave a contented sigh, and fell into such a deep sleep that we were able to transport him in his carrier to the dark and quiet of our bedroom, where he managed to doze for about an hour. When he awoke, I wanted one last opportunity to capture him in his outfit before changing him into something more comfortable. He was initially quite determined to remain stoic (when he wasn't attempting to dive forward off of the couch). His Aunt Ali managed to coax a couple of smiles out of him in the end, though. Feeling sentimental, I took one last picture this evening, of his shawl, his shoes, his bib and his candle. And now I wonder, what will Raspberry wear on his or her special day? My gown, or Tom's suit? Whichever it is, I feel so blessed that we have been able to pass on the pieces of our own childhoods in this way.